Review by AllTheBestFights.com: 2016-04-09, fight not particularly exciting between Brian Rose and Matthew Macklin: it gets two stars. Brian Rose entered this fight with a record of 28-3-1 (8 knockouts) and he is ranked as the No.16 super welterweight in the world. He lost to Carson Jones last year (=Rose vs Jones) but then he took revenge on him (=Jones vs Rose 2) and he beat Ruslans Pojonisevs. three bouts defeating Jason Welborn in his last one (=Macklin vs Welborn ). 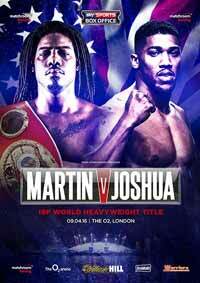 Rose vs Macklin is valid for the vacant IBF Inter-Continental middleweight title; undercard of Charles Martin vs Anthony Joshua. Watch the video and rate this fight!